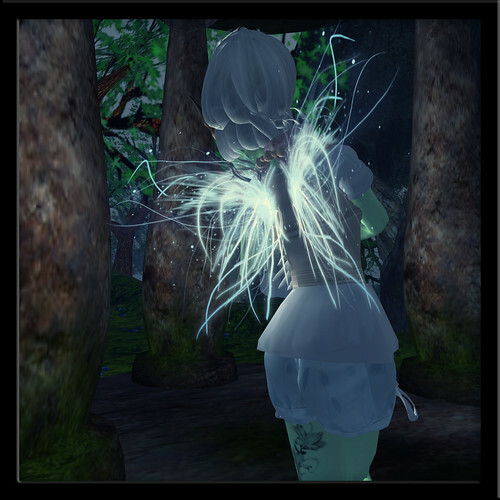 An adorable shop named Onigiri made these magical glowy-lace wings. I wasn't quite sure what to stick them with until, erm, this very pastel skin and Paper Couture outfit showed up. Now I'm a pastel pixie, harbinger of...roasted marshmallows, or something. Onigiri also has light, sweet anime skins, flowers and plushies for the arms and hair, Persocom ears, and a moon that you can totally sit on -- well worth a visit! When I think pixie, I think Dusk -- the photos are taken on this gorgeous sim, which is home to First Flower, October Rust and Charmed Poses. They've done up the sim like a Celtic swamp (I hear there are WoW references to the Night Elves, but I don't know this world well). Wow great shots! I am really enjoying your posts ! And yes, Dusk is awesome, and I feel lame for not getting back to one of the owners about renting a spot. @_@ Thanks for inadvertently reminding me that I need to apologize. shelby: :p ... i keep playing with photoshop. someone should stop me from inflicting it on people eventually. well cool, would be nice to see you on dusk ! I love that you don't shy from dark darks and bright aglow lights and have real extremes in your photos. I know the convention is to avoid light and shadow in fashion photos - but that's where the artistry is found. thanks for that comment, cajsa -- i absolutely love the lighting in your photos, so that means a lot to me.